Constantine the Great, AD 307 to 337. AE 3. LONDON MINT. Denomination : AE 3. Mint : London. Date : ca. AD 318. Size : 17.9 x 18.8 mm. Weight : 2.89 grams. Reference : RIC VII #138. Sear 3881 variety. Grade : gVF with a dark brown patina, but minor porosity on the obverse and the mint mark is weak. Obverse : Head of Constantine right, with CONSTANTINVS P F AVG around. 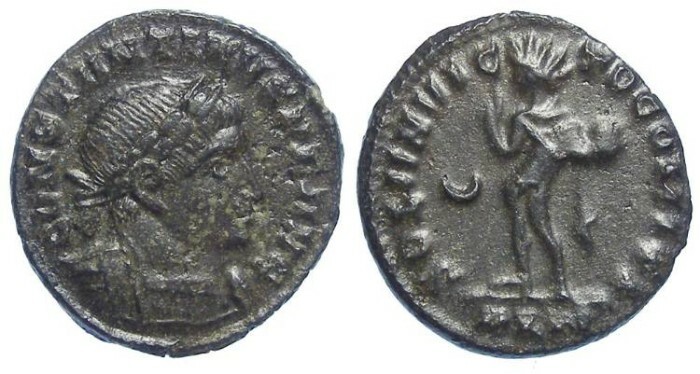 Reverse : Sol standing forward with head left and one hand raised, holding a globe, with SOLI INVICTO COMITI around, with the mint PLN in the exergue, with a crescent in the left field.